When faced with the task of choosing photographs of the women included in the Half the History project for the launch of our website, I came upon an unexpected dilemma. I thought I would simply find a picture of each woman, preferably from the waist up in a semi-professional pose, but as soon as I began my Google searches, I realized there were far more decisions to be made. If I had one chance—one image—to represent each woman, how could I make sure I respect their wishes and choose a picture that accurately represents them? How can one picture possibly make a statement about an accomplished woman’s life work, and would the subject in question agree with my choice? 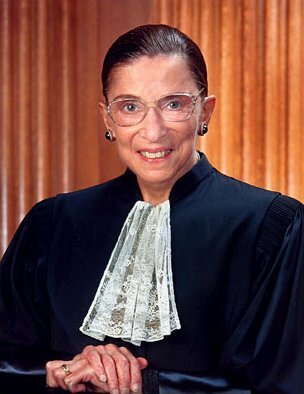 The first woman with whom this issue became evident to me was Supreme Court Justice Ruth Bader Ginsburg. I typed her name into Google images, and amongst the memes and Photoshopped cartoons, I found pictures of her pleasantly smiling, and others of her looking directly into the camera rather stern, large glasses covering most of her face in front of a shelf of books. Smiling, she looks like a nice, albeit frail, old woman that could be anyone’s aunt or neighbor. With a serious expression, she looks threatening, or simply just judgmental. My instinct was to choose the photo in which she a sweet old lady with big earrings. Wouldn’t want to scare away readers of our website because of a photo of a threatening woman, right? That was the moment I, a self-identified young educated feminist, realized I thought the picture of Ginsburg in which she is a threatening and intelligent being, would be off-putting to viewers, especially when placed next to 50 other photographs of stern women. But, we see collections of men with serious expressions all the time! Sports team rosters, Military officers…Why should it be any different with powerful women? Not to mention, if I decided on the smiling photo, am I diminishing her accomplishments by portraying her as sweet and arguably weak? 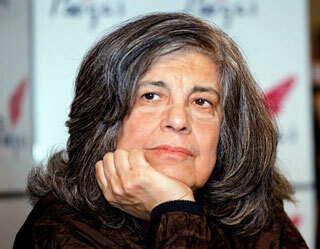 Next came Susan Sontag. I had read some of her essays, but never seen what she looked like, and she was nothing if not striking. 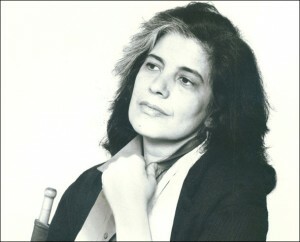 Sontag lived a reasonably long life, was active in traveling and writing about areas of conflict, and while she sometimes drew criticism for her opinions, her works remain influential. How can I possibly sum her up in one photograph? I was immediately drawn to the photos of her in what looks like her thirties or forties, pensive look on her face with an incredible streak of white in her full head of hair. But there were also photos of her later in life, bags under her eyes, streak of grey hidden amongst more greys in her hair. Now we reach dilemma number two. At what age do I choose to present this woman? Do I choose a young, attractive photo of her? 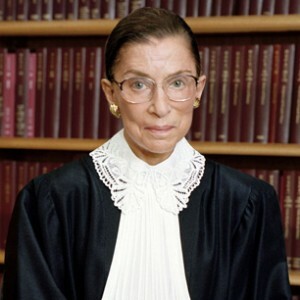 If I decide on one where she is old, will she be perceived as wise and well learned, or burnt out and powerless? Should I disregard what a viewer would think and choose a photo from the time in which she was writing her most famous works? Sontag and Ginsburg are only two examples of a larger issue. The presentation of women in media is a topic that people commonly discuss with regards to advertising, celebrity gossip magazines, and film and television characters. But what about those actively trying to positively portray women in history? Where do we fit in? Should we be concerning ourselves with a visually pleasing website that will engage viewers and encourage them to educate themselves about these women, or should we focus more on an accurate representation of our subjects? Are we taking into account how each woman might want to be portrayed, or simply going for a balanced, unbiased approach in which we find the photograph that makes less of a statement?